GPlates is desktop software for the interactive visualisation of plate tectonics. The EarthByte Group leads the development of the open-source plate reconstruction software GPlates. 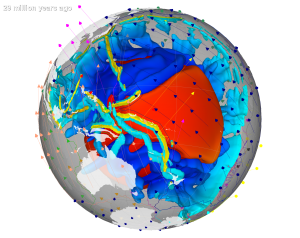 GPlates enables the interactive manipulation of plate tectonic reconstructions and the visualisation of geodata through geological time, and it facilitates interoperability of plate tectonic data and models with geodynamic computing services for applied and fundamental research purposes. The EarthByte Group has now moved GPlates functionality into the Cloud, as a set of interactive Virtual Globes. GPlates development is part of the AuScope research infrastructure programme. AuScope Ltd is a non-profit company formed to facilitate the implementation of a world-class infrastructure system for earth science, funded by the Australian Government under the National Collaborative Research Infrastructure Strategy (NCRIS).